“Common Service Centers( CSC) are well placed to play umbilical cord role in the process of shaping new India where all services and incentives are available to the last man in the line at his door step” Union Minister of Electronics & IT and Law & Justice, Sh. 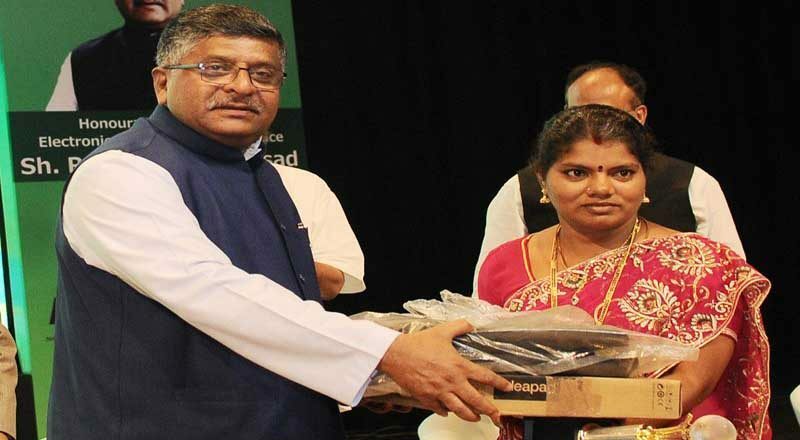 Ravi Shankar Prasad said ,today while honoring VLEs who have topped in transacting. Sh. Prasad added that there can be no other model which can ensure empowering of the rural people while protecting economic viability. He said CSC moment has reached a point of no return and it is bound to be a subject of research in the near future. Sh. Prasad assured the participating VLEs that every effort was been made to find a way for further strengthening their engagement in the process of reaching masses through the use of Aadhar. The Common Services Centers (CSCs) are an integral part of Digital India Programme. They are the access points for delivery of various digital services to villages and rural areas across the country and contribute towards fulfilling the Government’s mandate of a digitally and financially inclusive society. CSCs offer assisted access of e-services to citizens with a focus on enhancing governance. Apart from delivering essential government and public utility services, CSCs also deliver a range of social welfare schemes, financial services, education and skill development courses, healthcare, agriculture services and digital literacy. He said CSC SPV as a Corporate Banking Correspondent has signed agreement with 26 Banks (Public Sector Banks, Regional Rural and Private Sector Banks) for enabling CSCs to become Banking Correspondent Agents / Customer Service Points. CSC SPV has partnered with the country’s retail payment platform NPCI to launch Aadhaar-enabled payment system in January 2016. This service facilitates disbursement of government entitlements like payment under MGNREGA, social security pension, handicapped and old age pensions of any central or state government bodies, using Aadhaar authentication. At present, withdrawal as well as deposit facilities are available through CSCs under this system.CSC SPV has been granted license by Insurance Regulatory and Development Authority (IRDA) to market specific insurance products and services through Rural Authorised Persons (VLEs). The services include: Life Insurance, Motor Insurance, Crop Insurance, Health Insurance, Cattle Insurance, and Personal Accident Insurance from 37 Insurance companies. With the aim to provide grass root level access points for health consultation among the communities and effect a behaviour change among communities to seek preventive healthcare, CSC offers a range of healthcare services: tele-consultations, diagnostic services and affordable generic medicines through Jan Aushadhi Stores. CSC is offering video based tele-consultation service in allopathy, ayurvedic and homeopathy systems throughout India at affordable rates, through the platform of Digital Seva Portal. They also partnered with BPPI to set up generic medicine stores under the Jan Aushadhi Scheme at CSCs, with an aim to improve access to affordable and quality medicines for citizens in rural and remote areas. In the diagnostic CSC SPV has partnered with Hello Health, 3Nethra and Medi 360 to provide diagnostic services through the network of CSCs.